It’s easier than ever not to cook at home: Takeout, pickup, and a slew of food-delivery apps make no-cook eating as easy as tapping a few buttons on your phone. But that convenience can come at a high caloric cost. One simple — and usually less expensive — way to block those extra calories from heading for your waistline? Cook at home. Science backs it up, too: A 2014 study published in the journal Public Health Nutrition found that people who eat more meals at home consume 200 fewer calories at meals than those who eat out on the regular. And when these home cooks do eat out, they pick healthier options. 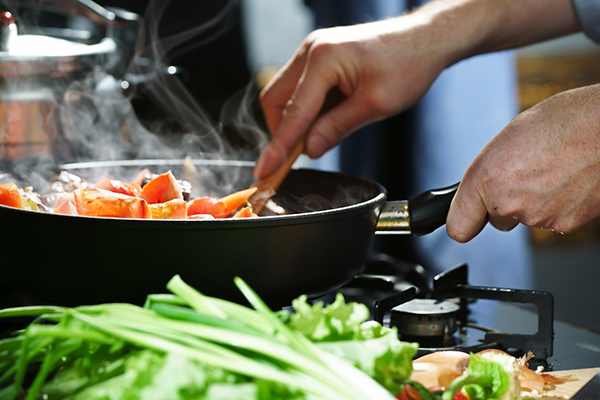 Find why firing up the stove can help you lose weight, and tips to make cooking at home easy and doable. But if you stick with healthy recipes, then you’re definitely giving yourself the home advantage. “The bottom line is that eating at home is healthier for you because it gives you so much more control,” says Meg Hagar, M.S., R.D., and author of Little Book of Kitchen Wonders. You know exactly how much salt or fat or sugar is going into your dish; you also have the power to swap ingredients in (and out) to fit your nutritional and caloric goals. And eating healthy at home doesn’t have to cost more: A study from researchers at the University of Washington found that home-cooked dinners were lower in fat, calories, and sugar — but not higher in grocery bills. The study also found that people who eat at home are more likely to meet U.S. government guidelines for a healthy diet. The control you get with cooking at home extends to other facets of your health as well: According to the Centers for Disease Control and Prevention (CDC), one in six Americans gets sick from food-borne illness each year. Of course, food poisoning can happen anywhere, but when you’re preparing meals at home, you know exactly how food is being handled — and how clean the kitchen is. One of the biggest reasons people eat out is for convenience. But that convenience comes at a hefty price: According to data from the USDA, Americans spend almost $3,000 a year eating out. We get it: It’s easier to just pick something from a menu versus shopping, preparing, cooking, and cleaning, especially if you’re crazy busy. But if you arm yourself with some smart shopping tips and time-saving meal plans, you can lose pounds and gain some cold, hard cash. Sounds easy, but the reality of it can be overwhelming. Start slow, like cooking three dinners at home one week. Then, the following week, add two home-cooked breakfasts. Keep building on each subsequent week until it becomes a habit to cook at home, instead of eating out. Put your meal on a plate before you sit down to eat; no eating out of bags or boxes of food. Keep healthy foods like fruits and nuts easily accessible and tuck the less healthy temptations in the pantry or cupboards. Put away all electronics — be mindful of what you’re eating and how much. “At home, you can turn off distractions while eating, allowing you to really tune into our hunger signals and avoid overeating, ” says Hagar. 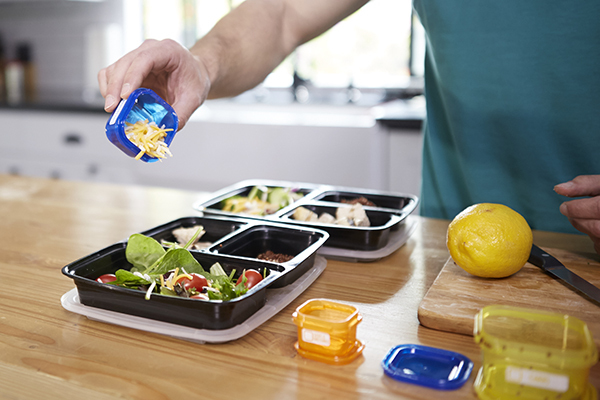 Use portion-control containers to make sure you’re eating a balanced meal. “Load up on veggies and lean proteins plus a small amount of complex carbohydrates to make your plate look more full of food,” she advises. While we’re definitely fans of eating at home, that doesn’t mean you have to be a hermit who never enjoys a meal out. Scope out the menu online beforehand to see which meals will fit your goals. Chain restaurants are required to list calorie counts and other nutritional info, making the search for the right dish a lot easier. Don’t be afraid to ask for substitutions, or for dressings and sauces on the side — or not at all. And don’t beat yourself up if you eat out more than you plan to. Just roll with the punches and know that making the switch to healthy cooking and eating, like with any new habit, takes time to master.